Norway’s west coast city of Ålesund was caught in conflict this week after the local committee in charge of planning Constitution Day festivities on the 17th of May turned down a request from a local school whose children wanted to carry their hand-made flags in the annual parade. Now some city politicians say they fear their city is being branded as racist. That’s because many of the hand-made flags, drawn on paper in connection with Aspøy School’s 90th anniversary, feature the Norwegian flag on one side and the flag of the child’s homeland on the other. The school has many children with immigrant parents, and school officials thought it would be a good idea to wave their flags on Norway’s national day as well as the Norwegian flag. 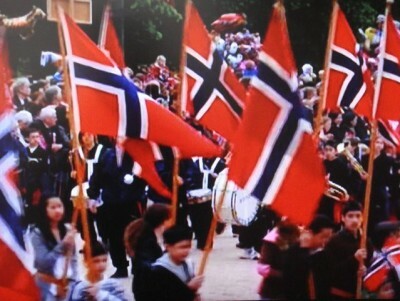 The 17th of May committee disagreed, with its members saying they would prefer only the Norwegian flag in the children’s parade. News of the committee’s decision clearly upset some local residents, who spread it quickly around the country, setting off online debates and charges that Ålesund’s civic leaders were being nationalistic or worse. That in turn has sparked reaction from local politicians, with a majority on Ålesund’s City Council (bystyret) now saying they think all the children’s flags should be allowed. Dale doesn’t think it would have hurt anyone to see the flags from where the children came from, but agreed the 17th of May Committee should decide on the matter. Other politicians were raising a fuss and think the decision should have been made by the elected officials. Only the Christian Democrats (Kristelig Folkeparti, KrF) think that only the Norwegian flag should be allowed in the annual parade. Others parties were waivering, with the mayor offering to meet with the committee if members felt a need to discuss the situation of change their minds. Officials at Aspøy School seemed overwhelmed that their request to use the children’s flags had resulted in such controversy that hit the national media. As some commentators agreed it had been blown out of proportion, the school principal told NRK she felt the flag request was being misused by many with varying motives, that she and her colleagues wanted to drop the entire issue and she declined further comment.